How things change has a lot to do with how they stay the same. The conflicts in the human experience of living hasn’t changed since time eternal, and doubtfully ever will. Socialization may be a necessary ingredient for civilization but so is anger, fear, love, jealousy etc. We all run on emotion and nothing ever shows it better than our favourite TV-shows. What and who we think we are….who and what we aspire to. Where the realtime seeks to portray a better future, by peering back at history we get to edit some obvious idealism and ideology out and concentrate on the issues that links us to today. Which are those ubiquitous ones as mentioned before. Thus the past becomes the future and nostalgia becomes new. Ralph Lauren has been doing is his entire career. In fact it may even be his career. It’s a warm, wallstreet, win-win. What is really interesting is the way nostalgia flavours our tastes and preferences and how a TV-show influences fashion and industry. Obviously the synergies within the fashion culture dictates that if something catches on, make sure you’re also on it. Brands have associated with current affairs for ages (see Jackie O, Wallace Simpson) but now even fiction and it’s following can make a multi-national company change its marketing and its design. Releases now favour a more pro-active strategy to such retail partnerships. Put that in your bag and shop it. Surely this is not only a monkey see monkey do situation. Surely we cannot be so gullible as to watch four seasons of a show and make like Betty Draper, dress like Betty Draper, shop like Betty Draper? Did somebody say Carry Bradshaw? The consequences are shocking. Our identification with these characters are so strong that I suppose it will soon become permissible as a defense in criminal courts worldwide. As a fashion crime however there is never any defense for bad taste. 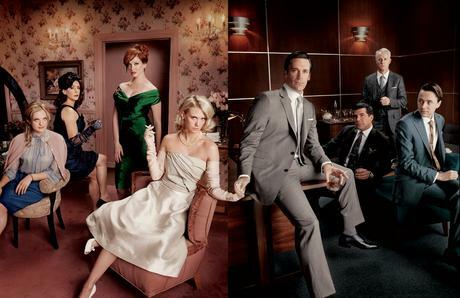 TV-shows are our new guide to fashion, manners, morals and meaning. This unstoppable frenzy goes from one to the next. The rebels can’t compete without becoming a movement in themselves. The recipe never fails, but why should it? People are people and remain the same no matter what else changes. We never tire of ourselves. So what if this is like ‘thirtysomething’ meets ‘desperate housewives’, you get the picture. Don Draper is a dead ringer for Ken Olin anyway and didn’t he also work in advertising? Nevermind. TV Shows are there because we identify with them or escape into them. Future, past and present all blend beautifully on our screens and help us pass the time in which we would probably have perpetrated worse deeds. As synchronicity would have it I am working on a campaign for a continental cafe franchise. Its identity is already associated with the 1960’s set and it would probably be foolish not to piggy back on the popularity of the retro TV-show. Whatever it is we do it is always in reference to what we have done before. Either as a counter- revolutionary- populist- tactic or a avant- garde- subversive- strategy. Nostalgia will always be new. The series channel is testament to that. We crave the security of the old and the interest in the new. This is all speculative and it may just be that after the conditioning of 4 seasons of this we have no choice to convert. Sorry, I meant conform. Again.